Ceramist, sculptor, poet, writer and installation artist, Ozioma Onuzulike was born in 1972 in Oji River, Enugu State, Nigeria. He graduated in 1996 with a B.A. (First Class Honours) at the University of Nigeria, Nsukka, where he also obtained an MFA degree in Ceramics / Mixed Media Sculpture. 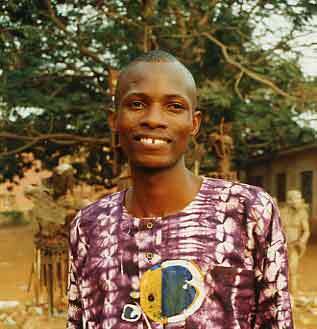 Onuzullke held five one-person exhibitions between 1995 and 2000, including his latest Earth to Art show held at the National Museum, Enugu, Nigeria. He has taken part in several group shows, including the recent New Energies exhibition curated by El Anatsul, which ran concurrently in two major galleries in Lagos: Mydrim Gallery and the Nimbus Art Centre. Onuzullke has also won several prizes and awards, including the National Council for Ails and Culture Prize (1996); the Faculty Prize for the Best Graduating Student, Faculty of Arts, University of Nigeria, Nsukka (1996) and the ACASA African Scholar Travel Grant to attend the Twelfth Triennial Symposium on African Art (2001). His poems, drawings, ceramic designs, reviews and critiques on art and literature have been published in several journals, magazines and newspapers, including The Guardian (Lagos), West Aftica (London), Okike (Nsukka), Glendora Review (Lagos), and Nka (New York).